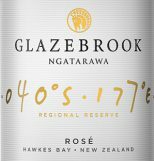 On the East Coast of the North Island of New Zealand, Hawke’s Bay enjoys a temperate climate ideally suited to producing full-flavoured wines showing strong varietal intensity. Vinification: A selection of Merlot and Pinot Noir grapes were harvested by machine. The juice was kept in contact with skins for a short period of time to extract the desired colour before pressing. Inoculation with selected yeast ensured a cool fermentation at 14 to 16C in stainless steel tanks. The component wines were then carefully blended to produce the desired balance of fresh red berry fruits and a distinctive, yet subtle herbal edge. A full and rich palate with mouth-watering raspberry, cherry and guava flavours. Smoothly textured with a finish that is crisp and dry due to a well-balanced underlying acidity.